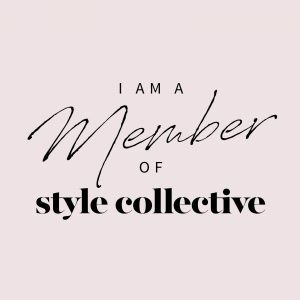 While my small wardrobe is centered around mix and match neutrals, every once in a while I crave a bit more color, pattern or BOTH! It can be just the thing to pull you out of the doldrums caused by a cold, grey winter. 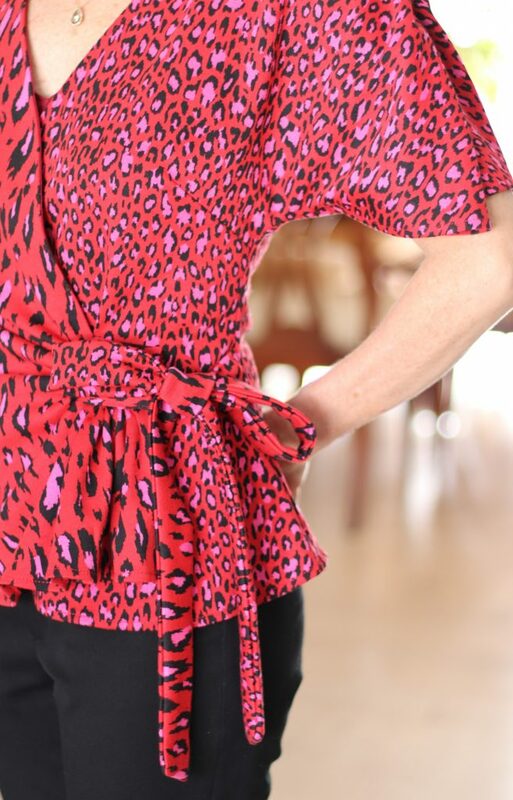 The red-pink-black palette of this leopard top seemed like a perfect fit for a Valentine Date Night look. 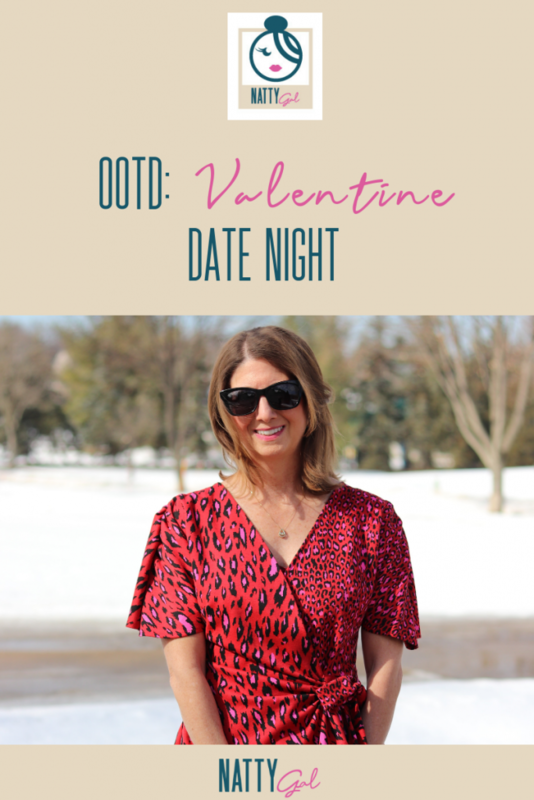 You may recognize the top I’m wearing from this Valentine Shop post. I ended up ordering it as I was really drawn to both the color combination and the leopard pattern. The top is a much thicker fabric than you would initially suspect! Almost like a ponte knit with a thin poly lining on the interior. Initially I thought this piece would transition nicely into Spring/Summer by pairing it with a walking short, but after getting it, I’ve realized it’s probably too heavy for hotter days. The top pictured is a size small. Because I have a small chest, I think I could have gone down into an XS and may have had fewer issues with the v-neckline peeking open. 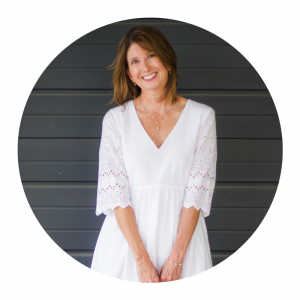 The trousers are one of my favorite basics – the Banana Republic Sloan Ankle pant. A black or medium-blue jean would also work great with this top. The shoes are staple from my special occasion capsule. The suede gives them a dressier appearance and I typically turn toward this shoe for nicer events when it’s too cold to wear a sandal. Use the arrow to scroll and see some “look for less” alternatives! 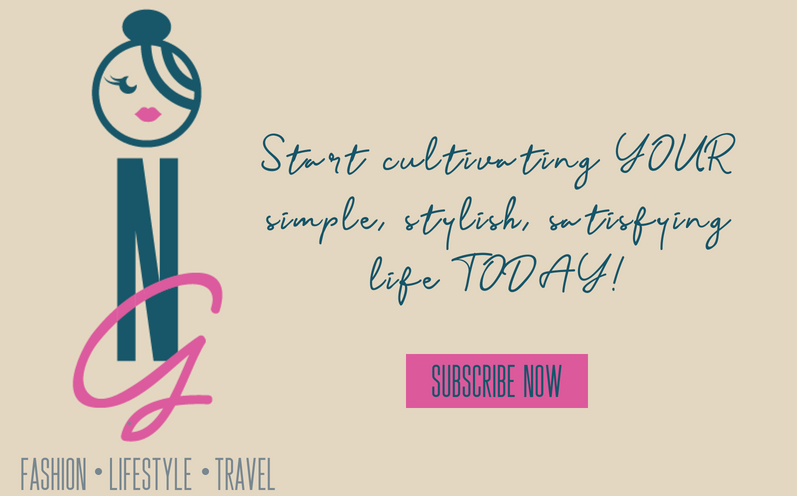 Until next time…keep cultivating that simple, stylish and satisfying life! 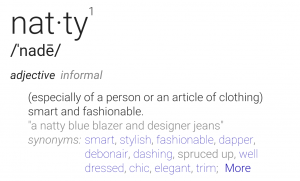 Your outfit it CUTE! And you look amazing !!! Thank you Susie! So glad you like it! This is such a fun outfit! 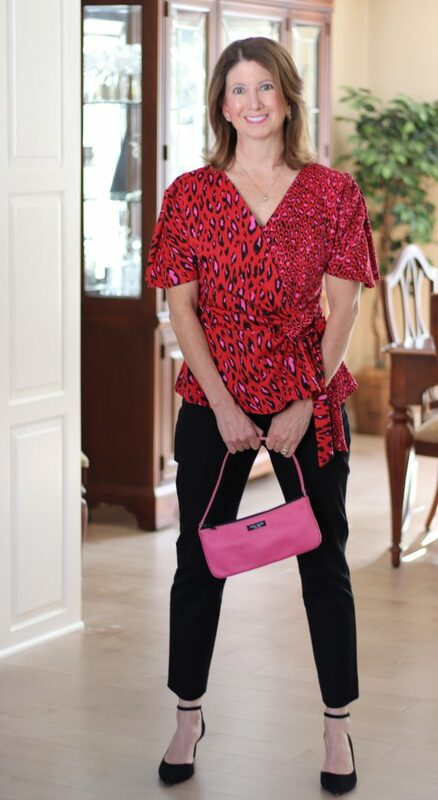 I love the way the print flows in the top and the surprise pop of pink, which you pulled out with the clutch! 🙂 I hope you’re having a great week! Thanks do much Chrissy! It’s a lot bolder than what I typically wear but I had fun. You have a good week too! That top is so flattering on you! Love the print and wrap style! Thanks so much Jill! Happy Valentine’s!